The US president said America helped Libyans avoid a "masscre" and will be a friend to those who "long to be free." 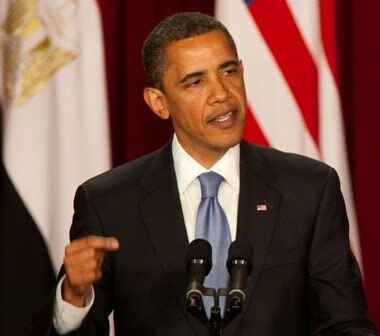 US President Barack Obama delivered a 29-minute speech about military action in Libya and the democracy movements in the Middle East on March 28, 2011, at the National Defense University in Fort McNair, Washington. The following remarks were distributed by the White House. Tonight, I'd like to update the American people on the international effort that we have led in Libya -- what we've done, what we plan to do, and why this matters to us. 1) The exact location of the original grave site is determined through the examination of aerial/satellite photographs. It is located “one cable’s length,” east of the old castle fort and an equal distance from the harbor, or about 600 feet – the length of two football fields. The target area itself, in what is now called Green Square (or Martyr’s Square) is about the size of a football field, and is mostly paved over with asphalt, but there are patches of green grass and trees, and the graves are said to be easily recognized from the ground. 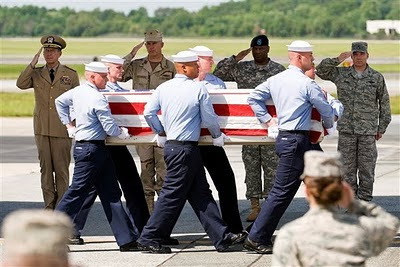 2) The situation in Libya must settle down, a new government must be established, and the repatriation of the remains of the men of the Intrepid from their original grave site must be made a priority by the US government and the military. 3) After permission is granted by the new government, who ever it is, a security team goes in and secures the perimeter of the original grave site, along with a photo/film crew who are responsible for documenting the proceedings. 4) After security is established, the archeology team from the DOD – POW/MP office goes first to the Old Protestant Cemetery and takes DNA samples from each of the five graves, and then proceeds to the original grave site and begins the archeology dig, very carefully removing layers of possibly concrete, grass, dirt and attempts to identify each of the eight remaining bones, distinguishing the three officers and the five men, possibly by buttons and/or location, as the three officers were buried apart from the others. 5) While the security team recovers the graves site and recreates the scene as natural as possible, leaving behind a small plaque in English and Arabic that describes the site as the original burial plot of the men of the USS Intrepid, the remains of the men are flown to the military hospital in Germany where autopsies are performed and DNA extracted from each of the remains. 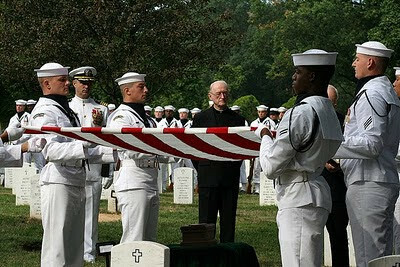 6) The remains are then placed in flag draped US military coffins and flown to the US military base at Dover, Delaware, where they are removed with a traditional “Ramp Ceremony.” The remains are then taken to the US military pathology institute in DC if additional autopsy and DNA testing is required, and then taken to the USS Intrepid air craft carrier on the West Side of Manhattan in New York City where a formal Repatriation ceremony is performed on deck a few days later. 7) After the official Repatriation ceremony, the officers are returned to their hometowns, Lt. Wadsworth to Maine, Lt. Somers to Somers Point, NJ and Lt. Israel to Annapolis, Maryland, while the other five men are taken by overland parade to Arlington National Cemetery where they are buried with full military honors in graves reserved for them. 2) Because it is a policy of the US military “not to leave anyone behind,” and there is an office POW/MP established as part of the Department of Defense that is paid and ordered to carry out this function, and does so with due diligence. 3) Because these men should be treated like all other US military men who die in combat overseas, and are buried there until they can be located and properly repatriated home. If these men were buried on a hillside in Vietnam or Laos from WWII or Vietnam, they would be home by now. 4) Because the officers they served with chipped in and commissioned the Tripoli Monument that is now at Annapolis, which was intended to be a grave marker for when the remains of these men were returned home, as ascertained by the inscription on it. 5) Because the Somers family always expected and still expects today that the remains of Lt. Somers will be eventually returned, as exhibited by the Somers monument next to the red brick school house that was paid for by his sister and was meant to be a memorial and grave marker. And as expressed today by Somers family members in Somers Point and all around the country, as exhibited by the letters they have written and the dozens of names on the internet petition. [See: http://www.petitiononline.com/Intrepid/petition.html ] to repatriate the remains of the men of the Intrepid. 6) Because these were the men who helped establish the principles and traditions that are maintained and upheld today by the many thousands of veterans who serve and have served in the military. These veterans recognize that we fight pirates and tyranny today for the same reasons they fought and died for then – our freedoms, liberty, democracy, civil rights, justice, and especially the principle and tradition being upheld by repatriation of the remains of American servicemen from the field of combat, wherever and whenever they are found. The veteran’s support for repatriation is exemplified by the letters they write and by their names on the petition to repatriate in noting the fact that they had previously served proudly on ships named the USS Somers, USS Decatur, USS Bainbridge, USS Sterret, USS Barry, USS Enterprise, USS Nautilus and especially the USS Intrepid, who want the official repatriation ceremony for these men held on the deck of the aircraft carrier in New York harbor. 7) Because when it happens, it will be an education for everyone who hears about it, and learns who these men were and how and why they died where they did, and how it is related to what is happening in Tripoli today. It will be an historical education for everyone. 8) Because when it happens, it will shine an international light on the home of Richard Somers, Somers Point, New Jersey, a small bay side town with good fishing and sailing, fine restaurants and a history that dates to the founding of the United States as a nation. It’s a town with a long memory, and citizens who have been patiently and anxiously waiting for the return of their native son for over two hundred years now. 9) Because Somers Point is in the country of Atlantic and the Atlantic County Freeholders have called for the repatriation of the remains of Somers; the State of New Jersey legislature has unanimously passed a proclamation officially naming September 4th Richard Somers Day and calling for the repatriation of the remains of Somers; and the US Congress, in anticipation of the repatriation, has requested that graves be set aside for the remains of the 13 men of the USS Intrepid at Arlington National Cemetery. 10) Because the celebrated release and return of the Lockerbie bomber from a Scottish prison to Tripoli set off celebrations and parties that led to the termination of dealings with the Libyans, and our reapprochement with the new Libyan government, who ever they are, must begin with the priority of the repatriation of these remains. The last time we began dealing with them, the first issue was oil, and now we must make the repatriation of the remains of Somers and the men of the Intrepid the new priority. Then we can have a celebrated return of our heroes and have our own party once they are home. • Department of Defense policy 300.18 mandates, “The remains of deceased personnel will be recovered, identified, and returned to their families as expeditiously as possible while maintaining the dignity, respect, and care of the deceased as well as protecting the safety of the living.” It makes no distinction of when the service member died. • The US military began in World War II to “Leave no one behind”. The POW/MIA office specifically deals with missing remains from World War II onward as well as “reintegrating” American service personnel who have been captured or suffered from an “isolating incident.” Let’s extend this same tradition to the men of the Intrepid. • Every member of the public who knows the story or is told the story asks why this hasn’t happened yet and how to get involved. Americans want their servicemen to come home. • Numerous requests of the Somers family and the public for the return of Richard Somers’s remains for over a century have gone unheard. As early as 1840, James Fenimore Cooper documented the desires of the Somers family, as represented by his sister, Sarah Keen, to have the bodies of the Intrepid crew returned to the United States. A grave marker located in the family cemetery in Somers Point has Richard’s information engraved upon it, one day hoping for his return. • This gesture will unite disparate communities that have members of the crew of the Intrepid – Boston, New York, Portland, Maine, Philadelphia, Somers Point, NJ, Baltimore and Annapolis, MD., and Norfolk, VA – into communities that share a common link. • The recovery effort will be a means of re-educating America about its nautical past and maritime heritage. The time of the Barbary Wars also serves as a link today with the Somali pirates. The parallels are very current. • This gesture holds faith with those currently serving our nation by proving with actions that we will not leave anyone behind, especially those we know where they are buried such as the men of the Intrepid in Tripoli on foreign soil, and in a cemetery not owned by the United States as other military cemeteries in foreign countries are. • Tens of thousands of military dead from previous wars are now buried in either the U.S. or in official military cemeteries in Europe that are now U.S. territory ceded to America by the host nation. The graves located in Tripoli are not in an American owned cemetery, suspect to neglect and damage from unrest in Libya. Given the recent bombing, it would be unfortunate if these American gravesites become part of the destruction. • These 13 men that died for our freedom should be properly honored for their sacrifice and the lives that were voluntarily given. • In terms of simple right and wrong, it is the right thing to do. Benghazi--Rebels said they suffered heavy losses in eastern Libya after being "tricked" by Muammer Qadhafi's forces, as the US pressed Africa to take tougher action against the strongman's regime.On the eastern frontline between the rebel-held transport hub Ajdabiya and the oil town of Brega, which is in the hands of Qadhafi's soldiers, a firefight on Monday left 21 rebel combatants dead, their commander told AFP. "Our men were tricked. Qadhafi's soldiers pretended to surrender, coming with a white flag, and then they fired on us," Mussa al-Mograbi said. That report sounds similar to the after action report on the battle between Sterett's schooner USS Enterprise and the pirate ship Tripoli, whose captain twice feigned surrender only to resume fighting again when the American's guard was down. The same tactic used by the pirate captain who killed Stephen Decatur's brother in the attack on Tripoli harbor in August, 1803, an act of treachery that Decatur avenged himself before the battle was over. In reviewing the history of those battles at Tripoli, two things stand out that should be lessons learned, including the Libyan penchant for feigning surrender, only to resume fighting again when the enemy’s guard is down. Another lesson is to prevent the co-opting of the purpose of the battles by accepting a peaceful resolution without accomplishing the mission or desired regime change. Both of these lessons were learned by the American combatants in the battles against the Barbary Pirates in the early 1800s. The first lesson, the pirate’s penchant to feign defeat and surrender, was learned during the first engagement between the Americans and pirates when Lt. Sterret, captain of the schooner USS Enterprise, came upon the pirate ship Tripoli in the act of commandeering an American merchant ship. Sterret and the Enterprise effectively attacked the Tripoli, but after the captain of the enemy ship appeared to surrender, striking their colors, they resumed fighting again until they were thoroughly and decisively defeated. During one of the two US Naval attacks on Tripoli harbor, Lt. Stephen Decatur led one task force while Lt. Richard Somers led another. In the course of the battle, Decatur’s younger brother was killed by a pirate captain who had previously surendered, an act of treachery that led Stephen Decatur to abandon a captured enemy ship in order to avenge the death of his brother, which he did. While the navy bottled up the pirates and kept them busy in Tripoli habor, US counsel to Egypt William Eaton, USMC Sgt. Presley O’Bannon, a few hundred Greek Christians and a ragtag army of Arab mercenaries traveled 500 miles across the Libyan desert to attack and capture the eastern port city of Darma. There they gathered together and prepared to march on Tripoli and free the American prisoners being held there. When news of the fall of Darma reached Tripoli however, the pirate BeyYusuf Karamanli decided to negotiate, and US counsel Tobias Lear brokered a truce that freed the 300 captured prisoners from the USS Philadelphia, paying a ransom of $60,000, but no tribute, and allowing the Bey to remain in power. This co-opting of the war that we were winning decisively did not go over well with those who were fighting, or with those in Washington who wanted to win the war on the ground and sea and not accept any peace terms that failed to accomplish the mission, which they did. Today, as the Battle of Tripoli 2011 rages on, we should remember the lessons that were learned in the early Battles of Tripoli, and not accept a feigned surrender, or accept any peace terms that permit Ghadaffi to stay in power.